Shortly before “The Tiger” rolled to a notable second success at Aintree yesterday, Old Rishworthians completed a fine double of their own with a 19-16 win at Old Brodleians. 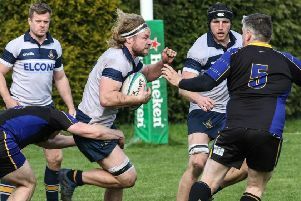 The Copley side have won only seven games in 25 Yorkshire One outings this season and Hullensians’ 30-27 win at Middlesbrough made it increasingly likely that they will finish in the bottom two and be relegated. However, they will take some crumbs of comfort from beating their across-town rivals in both meetings, having won December’s clash played in heavy rain by 18-15. Conditions were very different yesterday - bright, dry and good to firm underfoot - and Chris Stone’s men matched the grit of the little Irish horse to overturn a 13-3 deficit against their under-performing hosts. Rishworthians’ final opponents next Saturday are the thoroughbreds of Moortown, the runaway champions and winners of their last 21 league games, so it was probably more in hope than expectation that Stone, after yesterday’s game, called on his men to “play like our lives depend on it” next weekend. Stone’s counterpart Ollie Akroyd was struggling to come to terms with his side’s second half performance, describing it as “horrendous” and “embarrassing.” Brods have now lost three in a row and are in danger of missing their top-six target. The home side had their strongest side for a few weeks, with the pack bolstered by the return of beefy lock Tom Hanson, while Rishworthians were dragging players back from injury and post-haste from the airport - in flanker Harvey Keighley-Payne’s case - to patch up their side. Brods looked set to win at a canter when they surged into a 10-point lead after 16 minutes. An easy penalty for offside from Phil Town was followed by unconverted tries from Harris Morris and Michael Briggs with just a Josh Kelly penalty in reply. Morris dashed down the right touchline and fended off a couple of tacklers to score after Rishworthians had dithered under Joe Potter’s high kick. The second try came when drives from Hanson and Alex Dawson punctured the visitors’ defence before the ball was spun left for centre Briggs to finish from 15 metres out. Rishworthians were second best in the contact areas at this stage and were looking to the influential Ed Cockroft to keep their heads above water. The balance of power started to tip in the second quarter as Rishworthians began to dominate possession and territory, helped by a plethora of breakdown penalties awarded to them by the young referee from London. However, they lacked the punch and attacking skills to breach the Brods defence, Keighley-Payne going closest when held up over the line. Brods played the last 10 minutes of the first half and first 10 of the second half with 14 men after the back-to-back sin-binnings of flanker Ben Hoyle and scrum half Joe Armitage. Rishworthians made them pay with the assistance of the slope after the break. 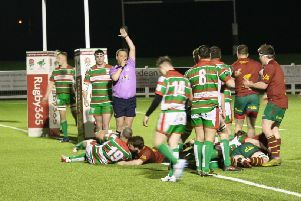 From a botched Brods scrum near the visitors’ line, Keighley-Payne stole the ball and passed back to Kelly, whose kick parallel to the touchline was seized on by Cockroft. He off-loaded superbly in the tackle and arch try-poacher Anthony Shoesmith completed the final 35 metres to the posts for a converted try. Kelly missed a 50th minute penalty from close to half-way but adjusted his sights to twice hit the target from slightly nearer and give Rishworthians a 19-13 lead entering the final quarter. Town clawed back three points with a penalty and then supported a run from Morris up the left touchline, only to be foiled by a try-saving tackle from young scrum half George Wright. Louis Butler and replacement Akroyd then went close to pulling the game out of the fire for Brods but Rishworthians, with Nick Faulkner prominent, were now winning the scrums and the forward battle and held up the ball in a Brods maul to reach the winning post.